Most items for rebuild can be shipped to us by regular UPS, FedEx or mail service. Along with the part, we need to receive your contact information and any special instructions. You can fill out our Rebuild Packing List or put the information on a paper and include it in your package. Make sure to use a sturdy box and enough packing material that your item cannot shift in transit. If you are sending an item on the list below, please click on the link or scroll down to read the special shipping instructions for your item. When you ship your steering gearbox to us, you also need to include the Pitman arm and the high and low pressure lines and/or fittings so that we can test the box when we are finished. Also if you are using a non-original pump, you need to send the pump to us as well so it can be modified to put out the correct pressure. Please call and talk to us if you have any questions. 208-684-4767. Drain all the oil you possibly can out of the torque converter. Stuff newspaper down into the neck of the torque converter. Place torque converter in a heavy garbage bag, twist bag shut and tie or tape the bag closed. Place bagged torque converter in another heavy garbage bag, twist bag shut and tie or tape the bag closed again. Pack torque converter in a sturdy cardboard box with plenty of packing material. 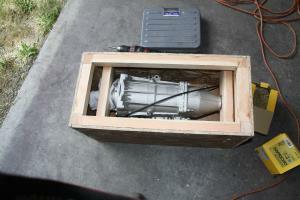 Transmissions and/or overdrives need to be shipped in a wooden box to protect them during transit. 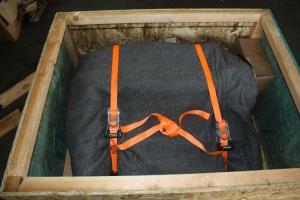 Here are a few pictures of different crates that we have received. If you do not have a way to build a box, we can ship one to you. We charge you a crate fee plus the shipping for this service. When you return the empty box after you receive your rebuilt transmission and/or overdrive, we refund the crate fee to you. 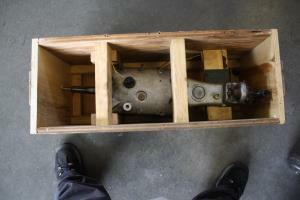 Once your gearbox is boxed up and ready to go it can be shipped by UPS or FedEx if it weighs 150 pounds or less. If it weighs more than 150 pounds it will need to be shipped by motor freight. Please click here for further instructions. 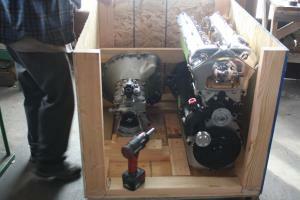 Engines have to be shipped by motor freight. To get started you need a sturdy, standard-size pallet. After that there are a couple of different methods. Lay your standard size pallet on the floor and place an old tire on it (the tire will NOT be returned). Next lay an inexpensive moving blanket on the tire with half of the blanket hanging over the side. Next lower your engine onto the blanket-covered tire so that it is laying on it's side. Now fold the rest of the blanket up over the engine. Use ratcheting straps to fasten the engine down to the pallet. Tighten them securely so that the engine cannot shift. Note: When we return your engine we will build a crate on your pallet to protect the engine. There will be a crating charge for this, generally in the $---- range depending on the cost of lumber. Lay your standard size pallet (40x48) on the floor and attach a piece of 3/4 plywood (not MDF or particle board) to it with screws. Now fasten some 2x4 footing pieces just inside the perimeter of the base so the sides will have a place to attach. Next stand your engine in place on the pallet and attach pieces of 2x4 on the base to keep it from sliding. Next cut walls out of 1/2 plywood (or you can use MDF or particle board) and attach them with 2x4s in the corners. Also attach 2x4s around the inside of the top of the wall pieces so that the top will have something to fasten to. Now cut 2x4s to box in the engine and anchor them to the sides to keep the engine from shifting during transport. When everything is secure, screw the top down on the crate. 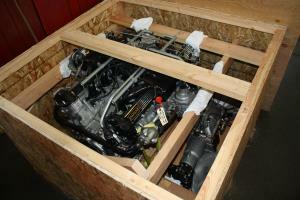 We will use the same crate to return the engine to you so make sure it is sturdy enough for a round trip. Address where the item is to be picked up. We will also need to know if this is a business address or residential address. There is a substantial extra charge for residential pick-ups and deliveries so if you are trying to save money you might consider if you or a relative or friend has a business where your item could be picked up or delivered. You can also save money if you have the ability to deliver your item to a YRC terminal. Click here to see if there is a YRC Freight Terminal near you. Dimensions and Approximate Weight of your shipment. We need the length, width and height of your item. On the height, make sure that you measure from the floor to the tallest point (not just from the top of the pallet). If you have an irregular shaped item such as an engine or differential strapped to a pallet, make sure that your measurements take in the widest points so that an imaginary box built using your dimensions would entirely enclose your shipment. If you do not know the weight, we can help you estimate it. If you need a liftgate or not. Not all YRC trucks are equipped with liftgates so we need to know if you require one to load your shipment so that they can send the right truck the first time. They also charge an extra fee for this service. If you have access to a forklift or a dock or can take your shipment to a YRC terminal we can avoid the liftgate fee. Packing list to fill out and send in with your item to be rebuilt.